First Line: "Fourteen year old Viktorija Lukas raced between the circus tents, her throat and lungs burning as she gasped for breath." 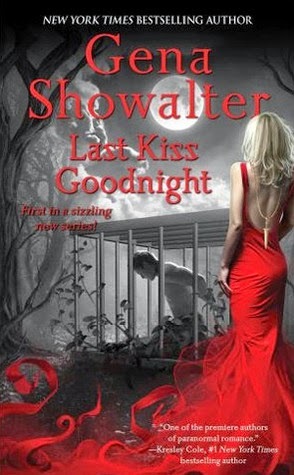 Review: An awesome cover but The Last Kiss Goodnight was not what I was expecting and not in a good way. I love the author seriously love her books and I tried so hard to even like this one but just couldn't. I get it the guy is in a cage on the cover so yes I expected that he will be spending some time in the book in the cage but I didn't think that it would be for practically the entire read. Majority of the story took place with Solo in the cage suffering complete degradation while falling for Vika who was a character that I found very hard to like. I mean I should have felt something for her she has been physically abused by her dad the man made her deaf but even with all that maybe it was the writing or the dialogue between the characters which felt so forced I still can't put my finger on it but no I did not care for her character at all. As for the plot not much happened. No i'm serious, not much happened, majority of the time Solo is in the cage as I stated earlier, every so often having fits of rage and Vika is on the outside doing her job of having to clean the otherworlders after drugging them up and every once in awhile bringing treats for them to eat and trying to find the key to free the otherworlders meanwhile we get to spend a lot of time in Solo and Vika's heads and learn about how much they desire each other. Things didn't pick up much until the end. Also it didn't bug me as much although now that I reflect back I did get a little annoyed by it, there are bible quotes with the start of every chapter. Then you had the two beings that Solo saw Dr X and E one represents good and the other represents evil and there were other little things throughout the book that made it at times a little preachy. I guess I just didn't expect it in a paranormal romance book having to do with assassins and otherworldly beings. Overall this book just wasn't for me I was bored throughout most of it.